Sean Dyche insists the deal to sell Sam Vokes to Stoke City was just too good to turn down - for all parties. Vokes has completed a £10m switch, with Peter Crouch coming the other way on a free transfer. 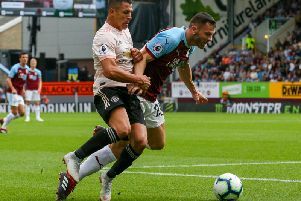 And while a number of supporters have expressed their disappointment, Dyche feels the fee, the fact the player wasn't starting regularly, and was keen for a new challenge, all added up to good business for a loyal servant. The 29-year-old has spent the best part of seven years with the club, twice winning promotion to the Premier League, and, asked whether the deal was just too good, Dych admitted: "I think it was, we speak openly, there's a business model here, we all know that, and sometimes it aligns to a situation where big decisions have to be made, and this was one. "There's a level where deals start, which is not acceptable, and there's a level it gets to where you have to start factoring in. "He also needs a challenge, he feels the time is right, he hasn't played as much recently, he's looking at the future thinking 'how much will I play? When will I play?' so he has to factor that in as well. "I've tried to be as open as I can with him, had a good chat with him, and he was proactive in his thoughts of going there, and taking on the next challenge." And Dyche wouldn't have brought in Crouch as an option if he didn't feel the 38-year-old still had something to offer at the top level. Dyche was impressed with a young Crouch while playing for Watford against Portsmouth in 2002/03, and has followed his career with interest ever since: "I have played against him, smashed him all over the place! "He played in a very strong Portsmouth side, they ran us ragged down there, it might have been 3-0 with Merse (Paul Merson) as well, just spinning in from everywhere. "Crouch was a handful then, he was only young, and that's probably the first time I realised, it would have been 2002/2003, I was at Watford, and he wasn't just a big player, you thought he's got way more, his touch, his understanding was gaining, but you could tell he wasn't just about being a big fella. "And you can see throughout his career he's proved much more than that. "Obviously his goals record as well, you look at his England goals, he's on the top scorers list for England, so he knows how to find the net as well as produce assists for others." Crouch remains hungry to perform in the Premier League, and Dyche feels he could have a similar impact to Joey Barton at Turf Moor: "I think the main thing for me is the motivation, regardless of age, you want motivation and fitness, he's hardly had a serious injury in his career, I know his stats, he still covers the ground - he's never been a sprinter as such, he's more of a leggy high-speed runner. "A different character, but similar to Joey (Barton), Joey was never a sprinter, but he knows the game and was fantastic for us. "He knows the league, teams, groups he's worked with - all of that rubbing off, and being himself. Here he'll have a clear platform to come in, enjoy what it is and hopefully produce on the back of that." Crouch is a popular figure within football, and Dyche hopes his character will be an asset in the dressing room: "He is well liked across football, forgetting about his ability just as a bloke. "I know recently he has done a book and he was pretty candid in it and pretty honest about his journey and how that has changed. I think his thirst now is to get on with football and play hard and take that side of it on. I don’t think many players come here for money, it is more about him taking on the next challenge and I think he is up for that." "I have always liked the player. That was very helpful that it was a player I had wanted. The point is that I wouldn’t have pushed someone like Sam out because Sam wanted a new challenge as well. "He is old enough and wise enough to know that now. He is rounded, he knows what we are about and what football is about. "Sam wanted that challenge as well. I think a helpful part of the package other than the financial model of the club is that we have got a player that I have always been a fan of and my staff have been a fan of."